MBBs have both managerial and technical responsibilities.They Facilitate a business area leadership team in developing an enterprise model and measurement map that is the process architecture for the performance measurement system. They also Lead the effort to develop a Six Sigma customer dashboard or business scorecard for monitoring the organization’s business y’s and provide rapid diagnosis of any detected issues to the level of the process x’s for definition of DMAIC projects.Coaching and advising business leaders in developing a portfolio of Six Sigma projects in their respective business areas. They Work with the management team to identify Six Sigma projects that encourage the completion of strategic business objectives and Develop the project management infrastructure for assigned business area Six Sigma projects. 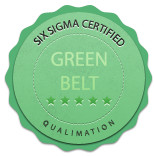 Black belts are the cheif change agents to the six sigma program. Qualimation will support you with strategies that are needed for the change. With Six-Sigma implenenation you will be able to witness a cultural change in the organisation. Using DMAIC you will be guided by Qualimation to raise the game in your organisation. The Black belts have to coordinate the complete implementation of six sigma in all their respective areas, as well as support the management in developing long and short term strategies. There will be intense statistical training and these include problem solving, statistical modelling, regression, data analysis, Reliability Engineering, hypothesis testing, process capability analysis, analysis of variance and design of experiments, failure mode and effects analysis, and statistical process control. 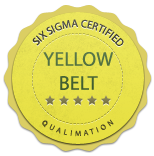 Qualimations offers the most promising Quality training with Six Sigma Black Belt for those interested in improving their manufacturing, service or other business operations. The course will include classroom training on the Six Sigma methodology coupled with an Industry Green Belt project. We bring you the best trainer in 6sigma with 20 years Quality Management expertise.. Invest in your career and your future by earning a Qualimations certification on Quality Assurance. Gain the advantage in your career and increase your potential for a higher salary. Qualimations offers the best program in Quality Management with practical application and certification. * Performance Analysis, measure the effect of change? Effectively use the DMAIC improvement process. Select successful Deep Analysis projects and project teams. Planning and execute long and short term quality plans for the company. Guide green belts in all their Quality Functions. Delivering meaningful results to the organization.